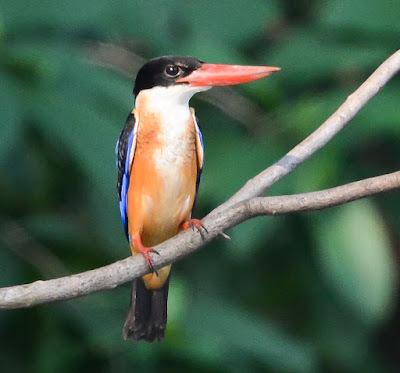 With changes in my family commitments in recent months meaning that I have less and less free time to either a) go birding, or b) write up my blog, I am now focusing on using eBird to record my routine birding activities. eBird has the advantage of a smartphone app that I can use whilst in the field to record my sightings, and these get fed into BCST's records system and help to build up eBirds' global database of records. 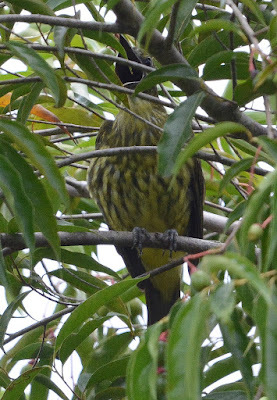 I will still post on this blog and on Twitter with more interesting records or trip reports. 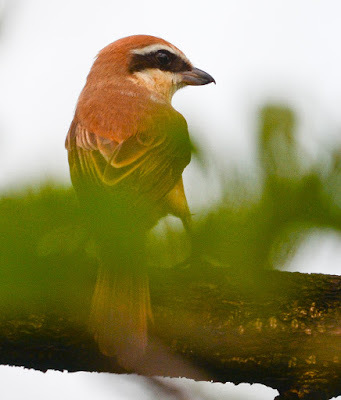 Birding around the Ministry of Public relations and Suan Rotfai in the last week has produced a few notable records, the best being the first Black-winged Cuckooshrikes that I have ever seen in Bangkok during the month of October (one male on 12th at the Dept Public Relations and a female/imm at Suan Rotfai on 15th). 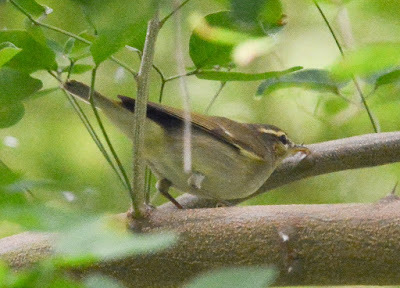 Other highlights included a pair of Peregrines at Dept Public Relations on 7th Oct.
Suan Rotfai provided a few interesting phylloscs on 15th with my first Yellow-browed Warbler of the autumn and an Eastern Crowned Warbler and Pale-legged Leaf Warbler feeding together (the PLLW ID's in the field based on call, with confirmation coming from a sound recording and spectrogram). This morning I took a stroll around the grounds around the Dept of Public Relations, a small area of parkland which serves as the best migrant trap near my house. Whilst checking a patch of trees where I had seen a male Siberian Blue Robin last week I heard an unfamiliar call - a rather flat, nasal "tik" repeated several times. 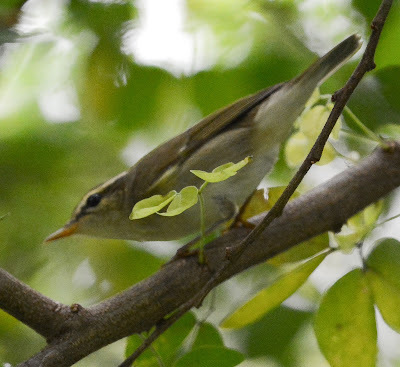 I was really unsure what might be making the call, but knew that it was probably something unusual as I've pretty much mastered the calls of the common residents and migrants that I encounter in Bangkok. I soon located the bird making the call and was a bit surprised to find that it was a phyllosc! The bird initially gave very poor views - making me think that perhaps it was one of the species I encounter rarely (such as Claudia's Leaf Warbler), but once I got a proper look at it I determined that it was "just an Arctic Warbler". But what about that call?! It really didn't sound like the explosive, buzzy "tzik" of an Arctic, but from memory it didn't sound much like either Kamchatka or Japanese. The bird promptly shut up, just as I got my iPhone out to make a sound recording (!) so instead I checked the calls in my playlist - it was clearly not the frog-like call of Japanese LW, but actually sounded much closer to Kamchatka than I remembered, although this bird seemed to be giving just the first part of the call (rather than the full "loose" or "dribbly" call found on the recording I had from xeno-canto). After some pishing the bird showed again and when I played the xeno-canto recording to it, it quickly moved from the high canopy of a tree some 10 meters away to the lowest branches less than two meters in front of me. It then started calling with the full version of the call, as if to confirm that I was playing it the right tape! 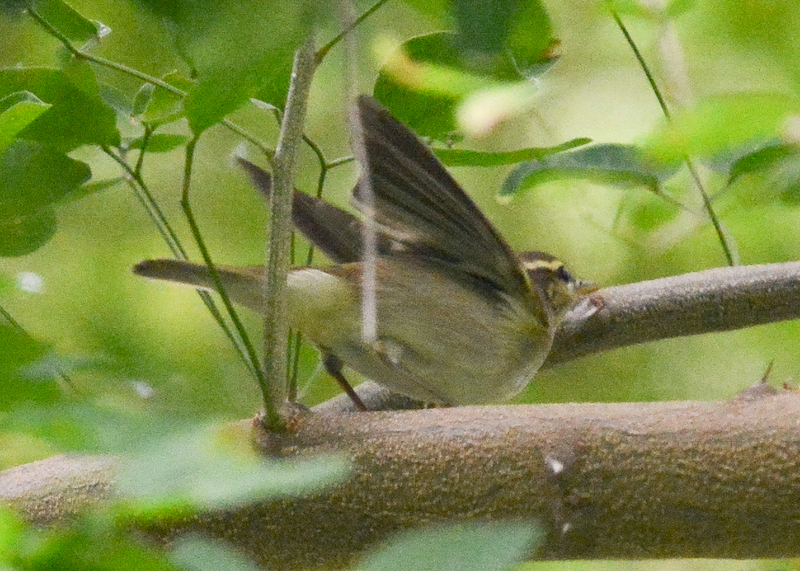 Whilst identification of Kamchatka vs Arctic based on plumage remains very much in its infancy, one thing that I noticed about this bird was how strikingly white the undertail coverts appeared compared with the flanks (and some of my images suggest a very light suffusion of yellow on the undertail coverts, see below). The research is out there. All we need to do is apply it. Birders fall into habits. 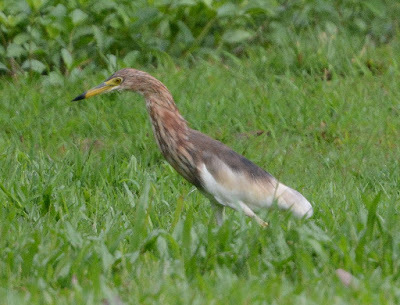 They often either get into the habit of attempting IDs on the wrong criteria (plumage and bare parts, for ex., in the case of Pale-Sak and Arctic-Kamchatka), or they get into the habit of throwing up their hands and giving up. Neither mistake is necessary anymore in the case of Pale-Sak. The research is out there, and it is saying call is diagnosable. 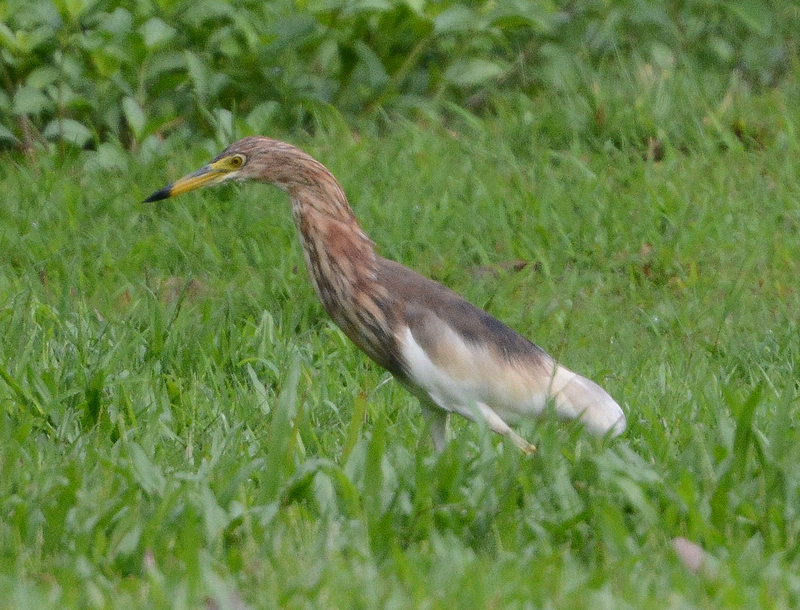 All that is left is for is birders to use that new knowledge. 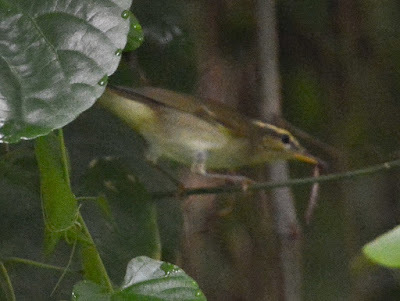 A walk around Suan Rotfai early morning produced a good sprinkling of migrants including my first Sakhalin Leaf Warbler of the autumn (one, possibly two birds seen in the field and identified on call), a female-type Stejneger's Stonechat, a Black-capped Kingfisher, 4 Brown Shrikes (one of which was lucionensis), one Arctic/Kamchatka Warbler (probably Arctic), one Eastern Crowned Warbler and a Taiga Flycatcher. Time has been limited for birding and writing up notes - I've been posting more on Twitter and have started recording me records on eBird. 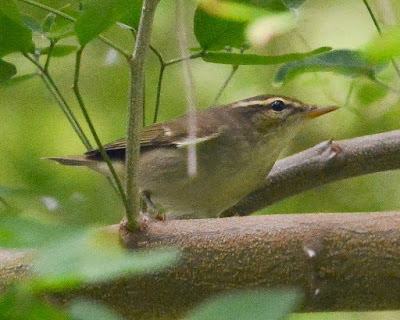 With travel away from Thailand during late August, my first autumn passerine migrant was an Asian Brown Flycatcher on 10th Sept (actually if truth be known my first passerine migrant of Autumn 2017 was was a Red-eyed Vireo in Panama on 26th August! 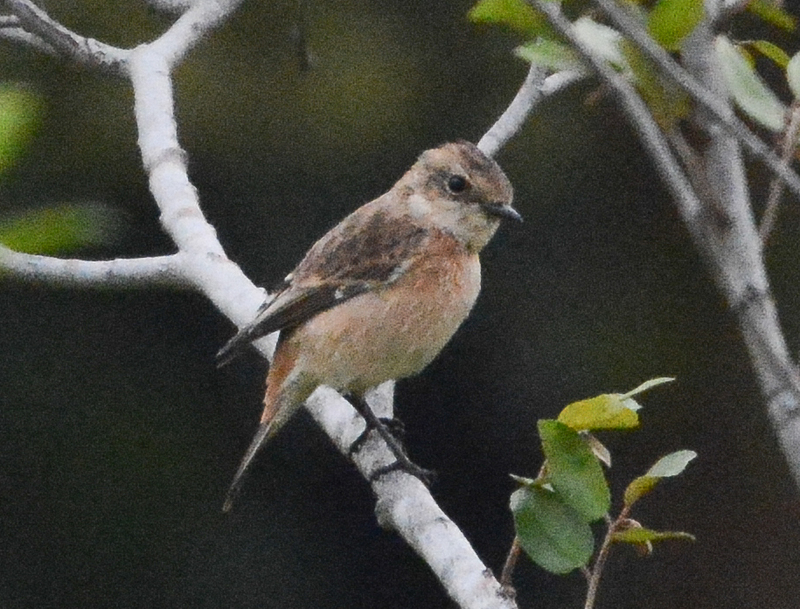 ), and this was followed with earliest dates as follows: a male and female Yellow-rumped Flycatcher and a Brown Shrike on 19th Sept, Eastern Crowned Warbler on 21st Sept, Common Kingfisher, Arctic Warbler and Taiga Flycatcher on 27th Sept, and Siberian Blue Robin (a fantastic male!) and Blyth's Paradise Flycatcher on 29th. The last couple of months have been quiet on the birding front, with various travel and family commitments keeping me from getting into the field. The highlight was an all-to-brief-visit to Panama for a friend's wedding in late August, travelling via Florida to see my in-laws. Florida in August (two weeks before Hurricane Irma hit) was extremely hot, humid and birdless, instead being filled with jet lag and family time - birding highlights there were limited to the usual suspects, but this being Florida the "usual suspects" are quite spectacular birds in very suburban settings - so a Loggerhead Shrike in a neighbours front yard, a family of four Sandhill Cranes in next door's hard and a Limpkin in the in-laws front yard were about all I could muster - but given that I've only seen the latter I think once before on four trips to central Florida, that's I guess not a bad garden bird! 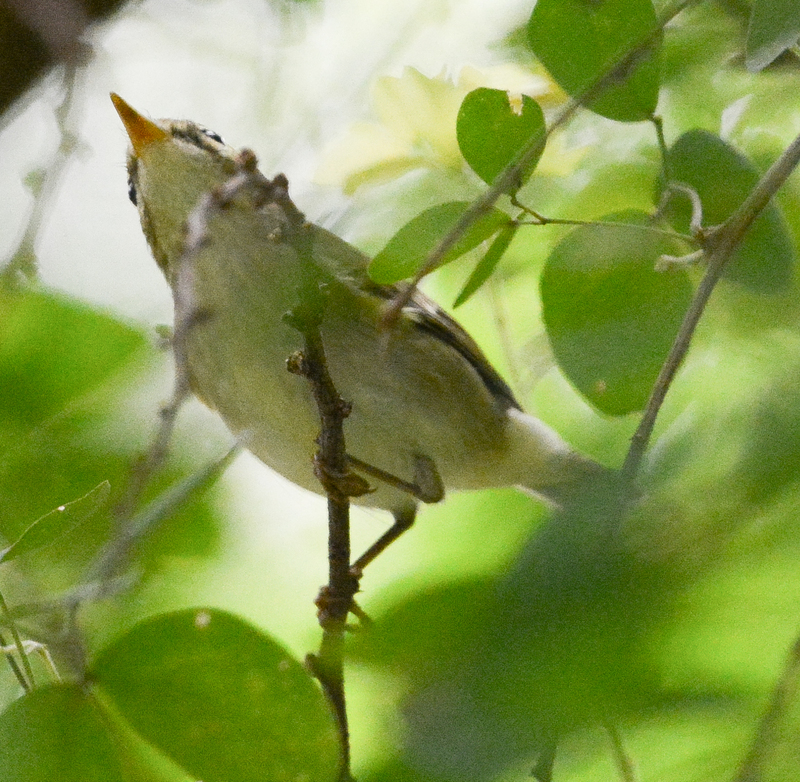 Our time in Panama was focused on catching up with long lost friends, but with the wedding taking us to the remote Bocos del Toro archipeligo there was always hope of snagging a few birds along the way, and with this being my first trip to the neotropics in more than a decade, I was keen to make sure of it. the wedding was on Isla Popa and we took over the only resort on the island (Popa Paradise) which proved to be an excellent destination. 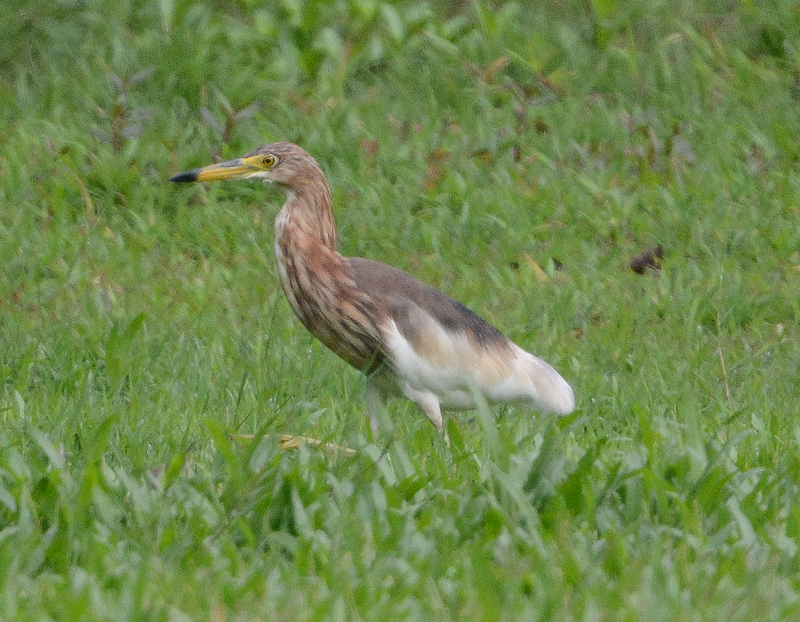 The birding highlight was doubtless me finding a femal-type Three-wattled Bellbird from the balcony of our cabin - not only an iconic Central American bird, but apparently rare and hard-to-find in Panama (so much so that the other Panama-based birders at the wedding never seen one...and didn't get to see this one...ooops!). 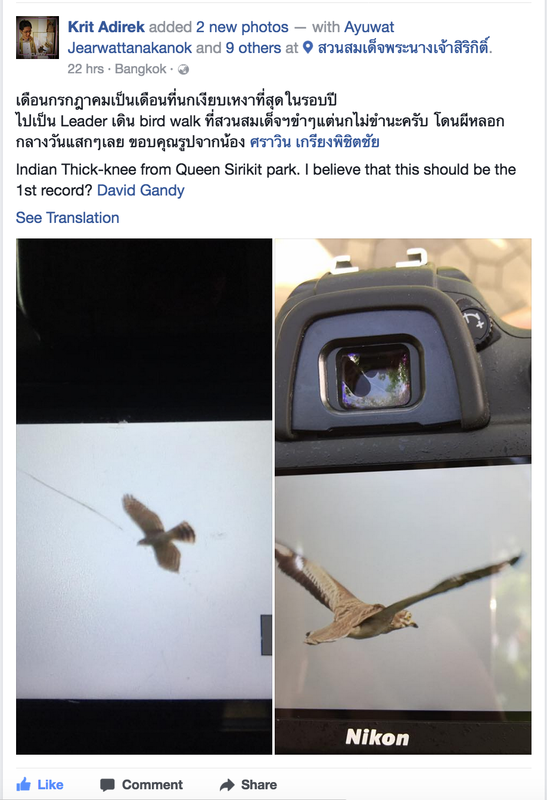 A Bird Conservation Society of Thailand (BCST) field trip to Suan Rotfai and adjacent Queen Sirikit Park pulled out a massive shock on Sunday (9th July) when they photographed an Indian Stone-Curlew in Queen Sirikit Park. 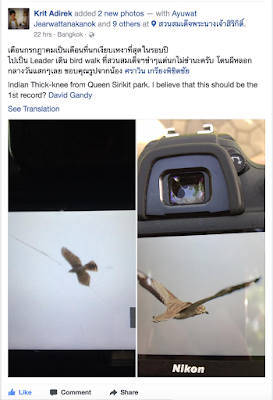 Whilst this was indeed a shock to read about, Indian Stone-Curlew is a species that i have pondered turning up on the patch - there seems to be a pattern of July-August records in central and western Thailand, presumably some kind of post-breeding dispersal, or failed breeders wandering from the birds usual range. There is also a record of a River Lapwing being seen in the park in July several years ago - so weird waders occuring in mid summer is not unprecedented. Yesterday (10th) I spent a few hours checking the patch and of course hoping to re-find the Stone-Curlew, but to no avail - of course there is the chance it is still present: the park is big and these birds are masters of camouflage, so I live in hope it'll be refound. Being mid-summer there were otherwise slim pickings to be had in the park, the best being a moulting adult Chinese Pond Heron (presumably an oversummering bird) amongst the Javan Pond Herons, and a pair of Barn Swallows - perhaps early returning migrants? Bangkok-based patch-worker in Suan Rot Fai, a large park close to the city's famous weekend market. 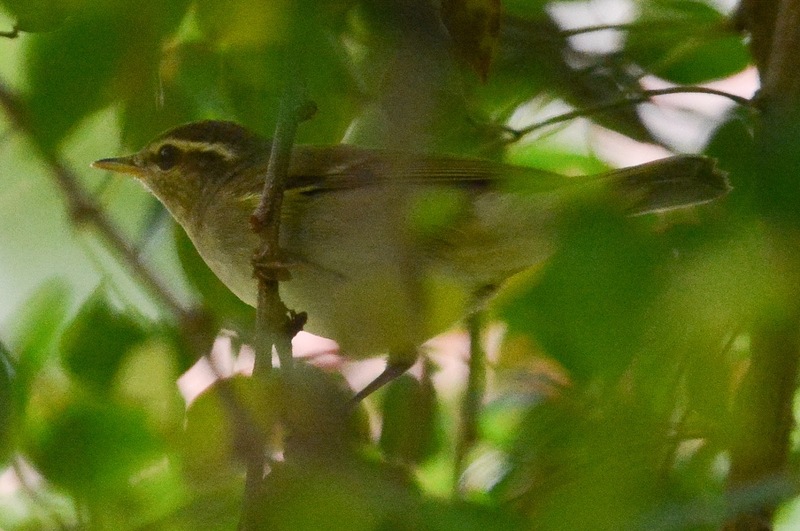 I have recorded 150 species on my patch since 2008. As one of the only big green spaces in the city, "SRF" acts as a real magnet for migrants during spring and autumn, and holds a healthy selection of "sibes" during the winter months. Neil and Eunice Birding Blog | Bird watching home (UK) and away.